Tohnichi supplies consumable parts for all its standard products, facilitating prompt repair by users and service agents. If your tool is over 5 years old, the part numbers may have changed due to Tohnichi's commitment for continual improvement. Tohnichi keeps parts available for models that have been discontinued - up to ten years after the final production date of that model. Having the model name and serial number handy, will help us quickly find the parts you are looking for. The Tohnichi Parts List is based on SI models. For Metric and American models reference the equivalent SI model, and then note the differences indicated for the other unit of measurement models, such as scale plates. To select the correct parts, confirm product model and serial number. Parts that have changed will show the applicable serial numbers. Many products are sold in packages that have different quantities than those required to repair a tool. 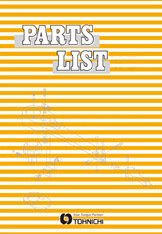 Parts shown in the Parts List with an * are normally in stock. Items without * have longer lead times. The number in the QTY column is the required quantity needed for repair. Numbers shown in parenthesis in the QTY column are provided as sub assembly. The Online Part Search System (Registration and Login Required) is available on Tohnichi's global website. It lets you search for parts required for the repair of most Tohnichi devices. For areas of the world outside Japan, click the "Worldwide" button to display the Parts List (part names are shown in English).